Green House, Good Life: Flora Focus: Roses! 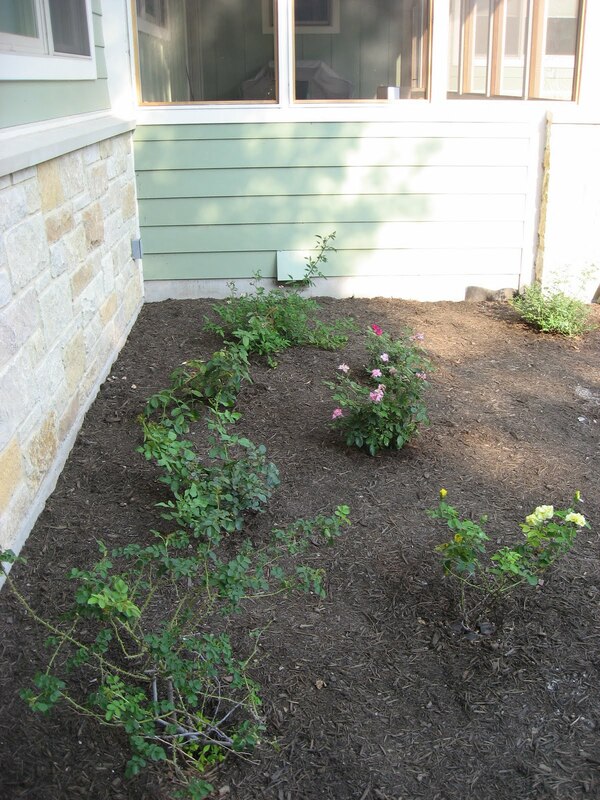 One of the parts of the yard that we're most excited about is our rose garden. On our landscaping plan, there was supposed to be a huge agave in the corner of the backyard between the screened porch and the master bedroom, and then three roses next to the agave under our bedroom window...but the plan didn't match up with the layout of our house, so the roses would have ended up roughly outside of our bathroom sinks. And the point was that we would be able to see them from our room. But we didn't want an agave back there anyway, so it was an easy decision to leave it out and slide the roses over under the window, where they were supposed to have been in the first place. And then, when we started shopping for roses, things got a little out of control. We each had certain ideas about what we wanted in the rose department. Steve knew he wanted a red rose that would be tall enough to be seen from our bedroom window (which is several feet off the ground). I wanted a Sweet Briar rose, a mutabilis rose, and some kind of yellow rose. And a pink knockout rose would be nice (since they're easy to grow and such prolific bloomers), although it wouldn't get tall enough to be visible from our bedroom. It's a flat, five-petaled rose (which Steve has a hard time seeing as a "real" rose), and there are three colors on the same bush -- peach, light pink, and darker pink. What's really neat about the mutabilis is that each rose turns all three colors in succession (hence the name "mutabilis"). It was also named by Texas A&M University as the "Earth Kind" rose of 2005 for being extremely drought-tolerant and otherwise well-suited to Texas. Since it grows full and wide, we decided that it would be nice in the corner by the screened porch. 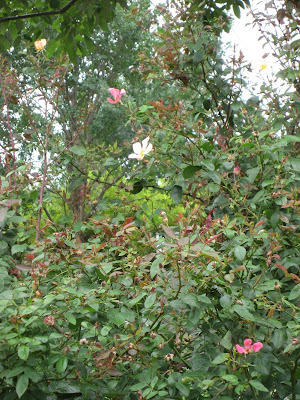 On our second rose-hunting expedition, Steve found two red varieties -- cadenza and red cascade. Cadenza has big red roses and will get tall enough to see from the window. 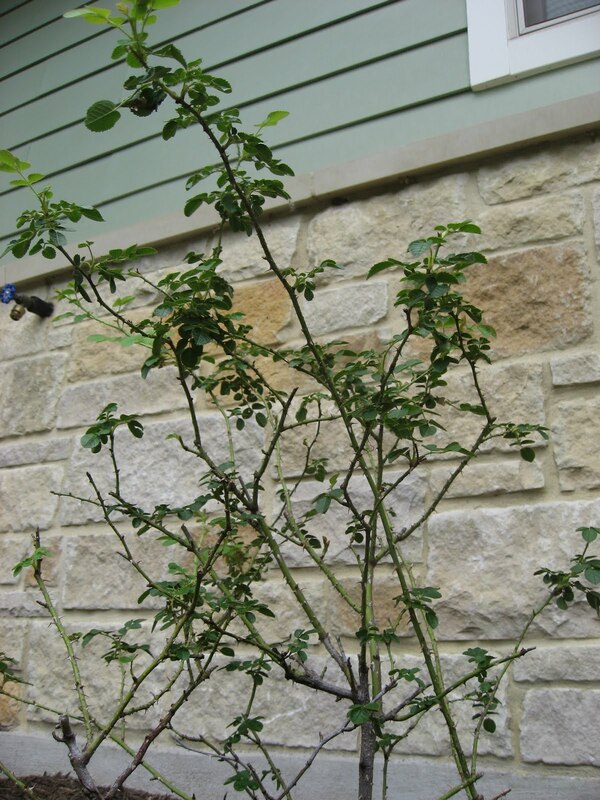 Red cascade is a climbing rose, which we hope to be able (after it has grown a bit) to wrap around a trellis for a tower of small red flowers. Steve also indulged my desire for yellow and found the buff beauty (which is more peach than yellow...not that it's had any flowers yet). 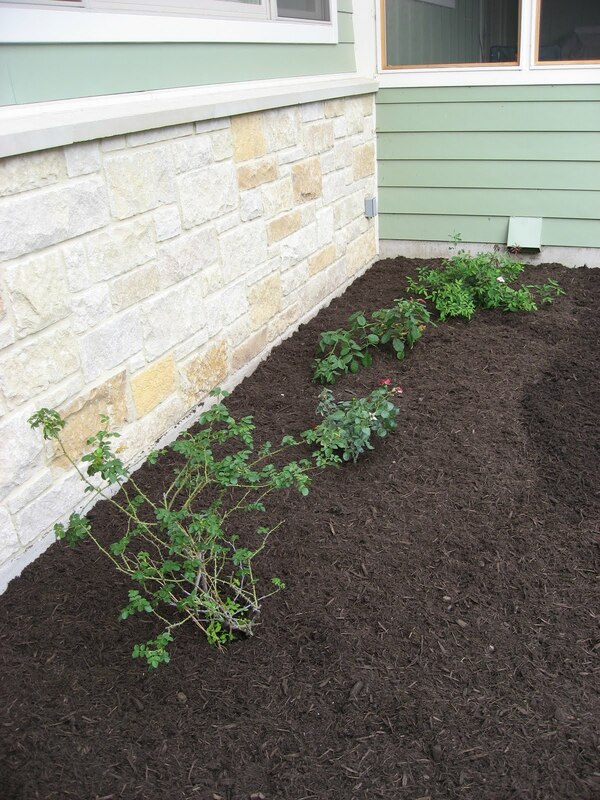 So, with the mutabilis, that brought us to four roses. 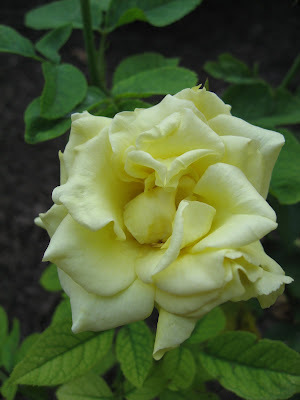 And then there was the Sweet Briar rose, which I really wanted to round out our rose garden. Fortunately, it was easy to locate in town. 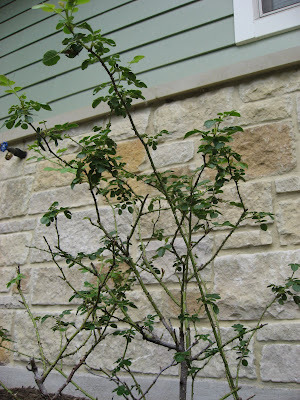 It hasn't had any flowers yet, and I'm not sure it will until next spring -- it's a single-bloomer and may have already done its single-blooming for this year -- but two things about it are really striking. I'd never really thought too much about the name of my college (Sweet Briar), except that it was named after a pink, five-petaled rose that grew there, but after spending some time with it, I have realized that the name of this rose is dead on. Even without flowers, its branches have the sweetest aroma, and it's much, much thornier than any of our other roses. "Sweet." 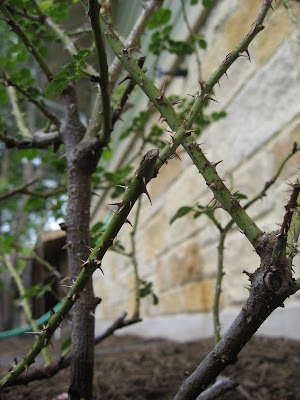 "Briar." I get it. Following the advice of a friend from law school, we laid full sheets of landscaping fabric, then cut X's where the roses would go and dug the holes (as deep as the pot, and twice as wide...or close). 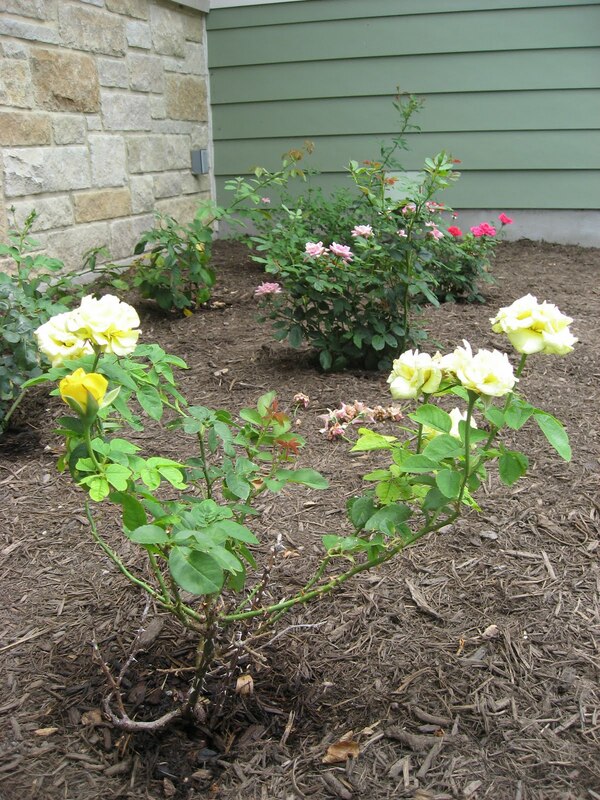 And then, after they were settled in, we went to Lowe's for more mulch and found that all of their roses were on clearance. (Yes, since it's been about 100 degrees for the last few weeks, planting season has ended in Texas.) We couldn't resist buying three more roses -- a pink double knockout, a red (actually bright pink) knockout, and a Grandma's (yellow) -- for a total of just $19. Since they're all going to stay shorter than the others, we put them in a second row in front of the first. And they've proven to be the best bloomers -- we've had roses non-stop since a day or two after we cut off all of the old flowers. One last rose- (and Sweet Briar-) related note: One of my creative writing professors, Carrie Brown, wrote a book called Rose's Garden that is probably the most beautiful piece of literature I've ever read. (And while we're talking books, Audubon's Watch, written by her husband, John Gregory Brown (also a creative writing professor at my college) is an amazingly complex, dark piece of biographical fiction that's well worth a read. And rounding out this installment of Devon's Book Club is Raising Holy Hell, written by no one I know (Bruce Olds) but assigned to me by John Brown during my biographical fiction class (which he was inspired to teach by his own process of writing Audubon's Watch...and which, incidentally, is about (the other) John Brown -- written in a way that's more interesting than you would ever think a book about an abolitionist's raid on Harper's Ferry could be).